Broadfork farm: Being intentional, keeping it simple, and innovating! This week we had the pleasure of stopping in for a visit with Shannon and Bryan at Broadfork farm in River Hebert, Nova Scotia. 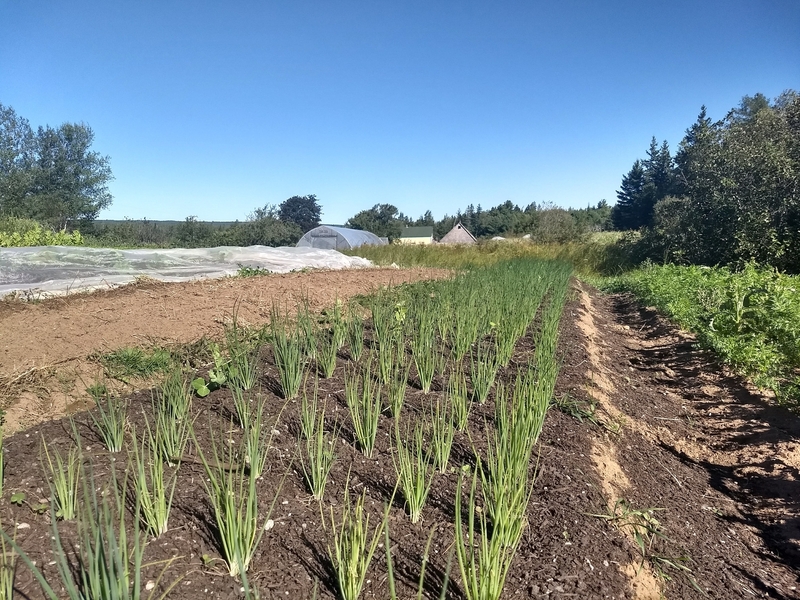 With 4 acres of tillable land and less than 1.5 acre in actual production, Shannon and Bryan make a full time living growing organic vegetables and cut flowers and working 5 days per week (Sunday and Monday is their weekend). 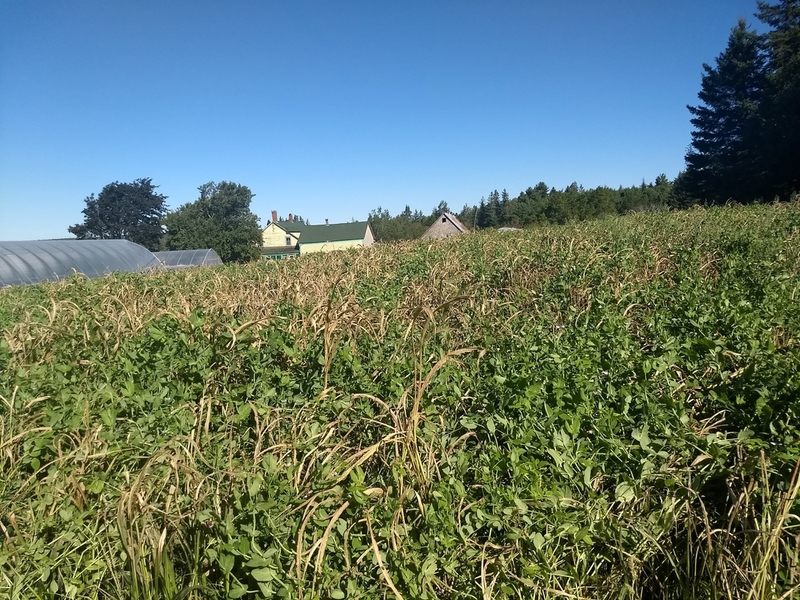 The farm basically follows a bio-intensive model except on a 7 year crop rotation including 4 years of green manure. The thing that stood out to me was their desire to keep it simple. Specifically, the fact that they only one off farm marketing trip per week to the Dieppe, NB farmers market, and have no employees at the farm (except a helper at market on saturdays). They also sell to a couple of restaurants that either pick up at the farmers market or at the farm. The decision not to have employees is based on their desire for freedom and flexibility in their schedule… plus they both have had farm management roles in the past and have learned that managing employees is not what they enjoy doing. Part of their success in keeping the farm simple is their willingness to adopt innovative techniques or to literally create them when needed. Here are a couple of photos to illustrate what I mean. 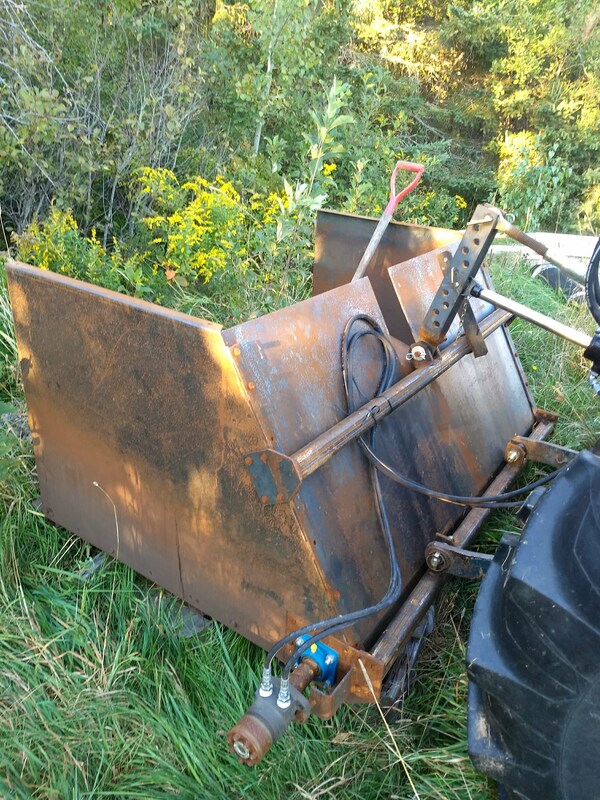 To reduce the labor needed to spread compost, they had this self loading compost spreaded built by a local machinist. 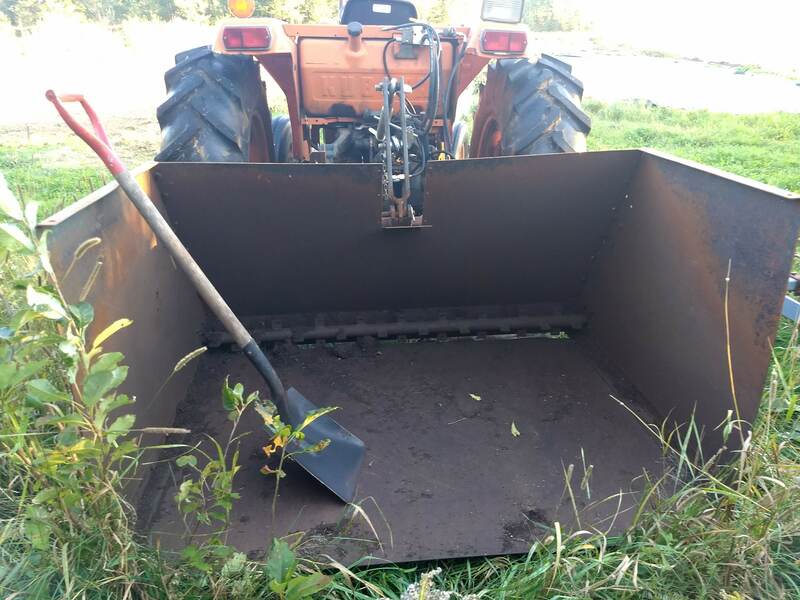 This self loading compost spreader allows then to spread compost efficiently without needing 2 tractors or a front end loader. The spreader is capable of spreading a light dose but takes 3 passed to apply the 2-3 inch layer required for the compost mulch weed management technique. The self loading compost spreaded drops te compost directly on the bed top without flinging it all over the place like a traditional manure spreader. One challenge Bryan noted was that the compost bridges if it is too moist. 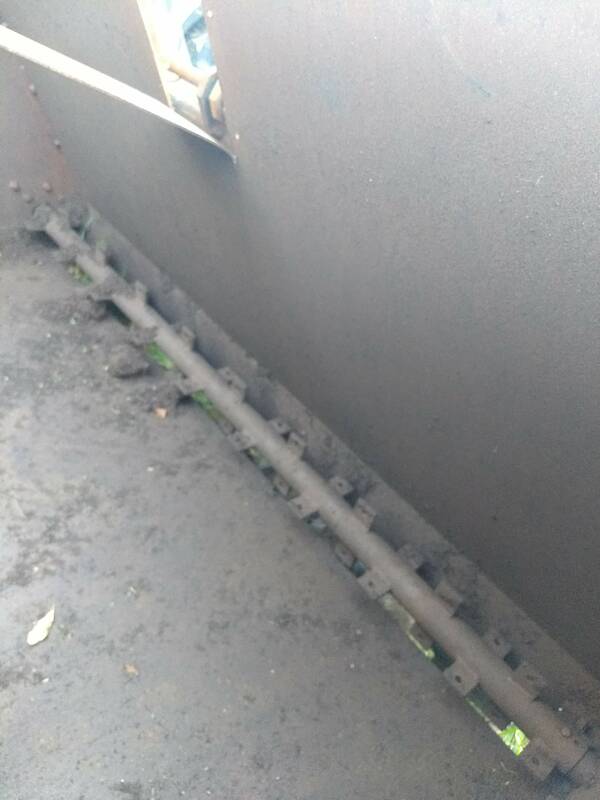 This could be addressed by the addition of a second set of beaters, or perhaps larger fins on the beaters. Notice the overhead sprinklers in the caterpillar tunnels… a nice touch I don’t see often. 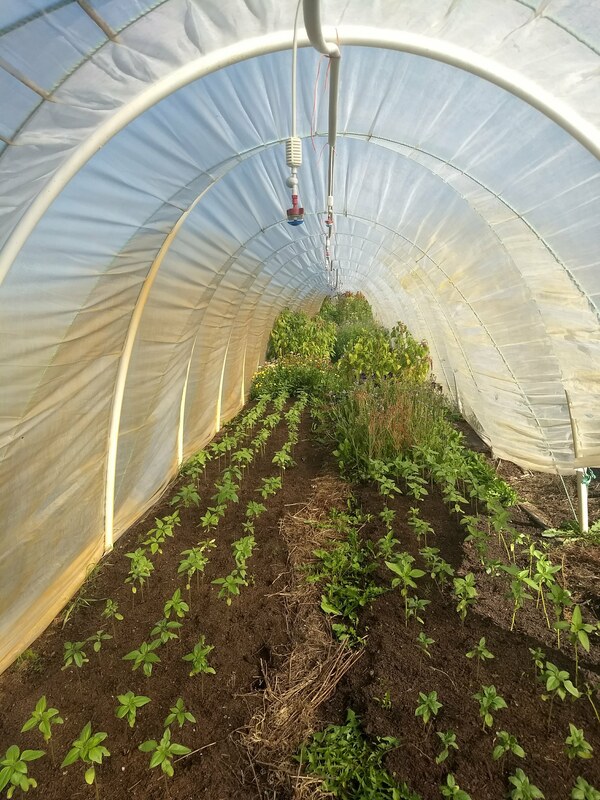 Also notice that the tunnel is filled with foliage and flower crops for bouquets; a crop mix that tends towards the highly profitable crops which is a key strategy in making a full time income from the farm. Sorghum-Sudan Grass (SSG) and forage pea green manure that will be mowed or rolled for the cucurbits that will be strip till planted next year with a landscape fabric mulch. We don’t often see SSG used in a green manure mix. I love the look of the frosted killed SSG with the peas just starting to climb up and dominate… I wonder what it will look like in a month! The SSG isn’t as tall as I would expect… late planting? Cooler maritime climate? The use of silage plastic for occultation is so key for getting the weed seeds to germinate prior to planting crops! Oh… and they have no internet or cell phones. I love it!! Talk about being a stand against the current IT addiction that is prevalent today! Instead, they use the local public library’s wifi 5 minutes away and have taken great advantage of the ability to schedule posts ahead of time to maintain an active presence on social media without bringing internet into their home. All of these elements point to how intentional Shannon and Bryan are about building a farm that fully supports the lifestyle they want to live. From the very beginning Shannon and Bryan have been very specific about what they want to create with their farm. They mention the Everdale Farm Business Planning course as having been very helpful in starting out the farm with a clear plan of what they wanted and what they didn’t want. Building on that, Shannon and Bryan have made a point of finding new tools every year to stimulate the reflection and discussion of what they want and how they want to guide their farm.These range from holistic farm planning courses, to RRSP retirement planning questionnaires, to ‘backcasting’ (rather than forecasting)(ie, reverse engineering the next steps based on what your desired outcome is).. to name a few. The point is that every year, they make the time and space to reflect, discuss, and make choices about the direction the farm is headed in. What outcomes do you want to produce on your farm? Where could your farm be simpler? Where might you be making things harder than they need to be? 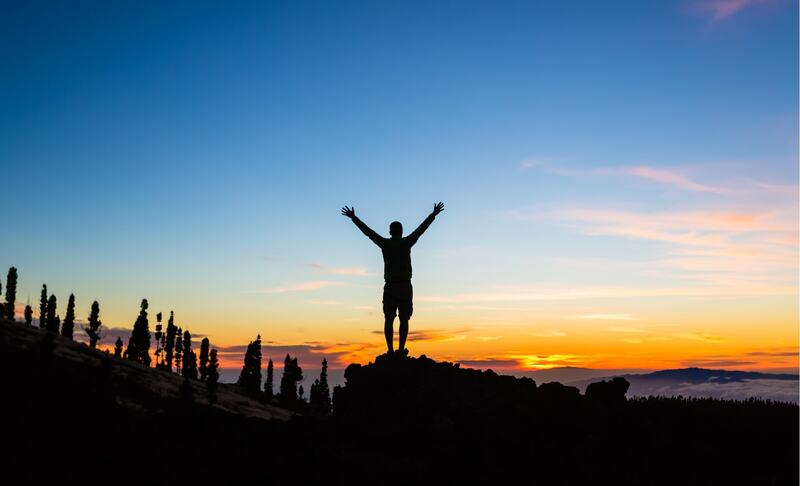 What would a truly satisfying lifestyle look like for you? I really appreciate the detail of your description of what works on this farm and how the farmers find innovative solutions. Very inspiring! Also you bring it back to lifestyle choices. Thanks! Thanks for the feedback! It’s so true how important it is to be aware of the lifestyle choices we are making rather than living as if we are at the mercy of the circumstances of our lives. 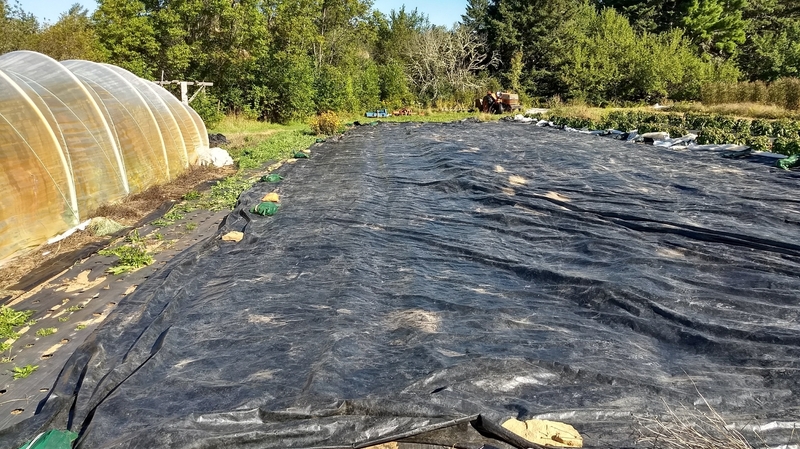 Previous PostPrevious 3 ways for organic vegetable farmers to take full advantage of the fall to build a solid marketing system for next year.